The video describes in detail the catheterization of the distal brachial artery in swine. This procedure accurately measures arterial blood pressure and is a simple and fast method to collect samples for arterial blood gas measurements. Uwiera, R. R., Toossi, A., Everaert, D. G., Uwiera, T. C., Mushahwar, V. K. Brachial Artery Catheterization in Swine. J. Vis. Exp. (145), e59365, doi:10.3791/59365 (2019). The video describes in detail the catheterization of the distal brachial artery in swine. This technique enables researchers to measure arterial blood pressure continuously and collect arterial blood samples to assess arterial blood gas measurements. Arterial blood pressures and arterial blood gases are important physiological parameters to monitor during experimental procedures. In swine, four common methods of arterial catheterization have been described, including catheterization of the carotid, femoral, auricular, and medial saphenous arteries. Each of these techniques have advantages, such as ease of access for the auricular artery, and disadvantages that include deep tissue dissection for carotid artery catheterization. The described alternative method of arterial catheterization in swine, the catheterization of the distal aspect of the brachial artery, is a rapid procedure that requires relatively minimal tissue dissection and provides information that is in line with data collected from other arterial catheterization sites. The procedure uses a medial approach along an oblique plane of the lower brachium, positioned between the olecranon and the flexor aspect of the elbow joint, and this approach allows researchers the major advantage of unimpeded freedom for procedures that involve the caudoventral, caudodorsal back, or hind limbs of the pig. Due to the location of the upper forelimb of the catheterized vessel and potential challenges of effective homeostasis following catheter removal from the artery, this technique may be limited to non-recovery procedures. Surgical intervention is used in experimental research to develop animal models that enhance scientific development. The scientific literature is filled with examples of novel surgical animal models1,2,3. Surgical procedures are a complex process involving not only the manipulation of anatomical structures but also complicated physiological interactions with various drugs required for anesthesia and analgesia. This interplay can induce major changes in physiological processes within the animal and as such requires vigilant monitoring of the animal4. Clinically successful surgical outcomes have been associated with measurements of arterial blood gases and arterial blood pressures5. These clinical parameters require the ability to measure arterial blood pressure and collect arterial blood effectively, which in turn requires the successful catheterization of an artery6,7. Arterial catheterization to collect arterial blood and measure pressure has been used in various animal species5,6,7,8,9,10,11,12,13,14,15,16,17,18,19,20,21 and in animals at different ages of development19,20,21 and has been directed at both recovery (clinical and diagnostic) procedures4,5,6,7,8 and non-recovery (experimental) procedures14,15,16,17,18. Moreover, the ease of arterial access and the location of the artery in the context of the surgical procedure are also important considerations when choosing an artery for arterial blood measurements. For example, the median caudal artery in dogs and the facial artery in horses, as well as the pedal artery in both dogs and horses, are used for diagnostic measurement and monitoring during recovery procedures6,7,8. In contrast, the carotid and femoral arteries are often catheterized in swine for either non-recovery or long-term catheter implantation experiments14,15,18. In swine, arterial catheterization to measure either arterial blood pressure or collect arterial blood has routinely employed either the carotid, femoral, medial saphenous, or auricular arteries22,23. For specialized non-routine procedures, other more unusual arteries have been used, including the subclavian and iliac arteries, to measure the brachial artery anatomical tortuosity17 and image the aorta16, respectively. Regardless of which artery is chosen for catheterization, each artery has inherent advantages and disadvantages for its use. For instance, the auricular artery is anatomically easy to access, but its use may be limited to its close proximity to the marginal ear veins11,12. In comparison, the carotid artery is relatively large and robust24, but it lies deep within the jugular furrow and requires substantive tissue dissection25. As such, identifying another artery that could be catheterized to measure arterial pressure and collect arterial blood is warranted. 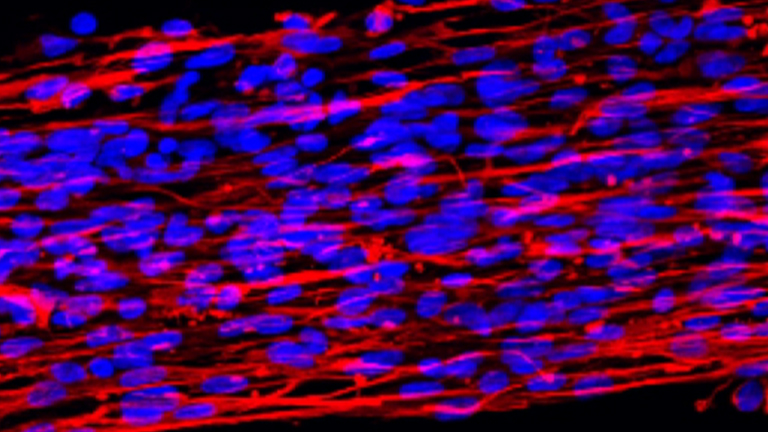 This video and manuscript describe in detail the catheterization of the distal brachial artery in swine, a technique that could be applied to non-recovery procedures. Notably, the pig brachial artery catheterization was used to measure arterial blood pressures and arterial blood gas parameters during a lumbar spine surgery with hind limb measurements (the data from this part of the surgery is not presented). 1. Surgical anesthesia and surgical preparation of the pigs. Premedicate 50 kg Landrace-Yorkshire commercial pigs intramuscularly with the anesthetic drug cocktail containing ketamine hydrochloride (22 mg/kg,), xylazine hydrochloride (2.2 mg/kg) and glycopyrrolate hydrochloride (10 µg/kg). Set up all equipment involved with monitoring clinical parameters at the end of the table near the pig's head. Ensure the equipment will not restrict access to the pig. Produce accurate arterial blood pressure measurement by placing the pressure transducer in a horizontal plane, level with the heart. Anesthetize the pigs with inhaled isoflurane gas (4%-5% isoflurane at 500-1000 mL/min O2) using a properly sized face mask. Visualize the vocal cords with a veterinary laryngoscope (17-25 cm long straight blade) and apply topical 10% lidocaine spay to the vocal cords to limit the risk of laryngospasm and airway obstruction. Intubate the pigs by inserting a cuffed endotracheal tube (9.0 mm internal diameter (ID)) through the vocal cords and maintain anesthesia with isoflurane gas (0.5%-3.0% isoflurane at 1000-2000 mL/min O2). Ventilate the pig on a mechanical ventilator (18-22 breaths/min) and ensure all expired anesthetic gas is scavenged and vented outside the surgical suite. Assess the level of anesthesia by jaw tone, and both pedal and palpebral reflex responses. NOTE: Administer intravenous Lactated Ringer's Solution (LRS, 10-50 mL/kg/h; see step 1.6) to enhance hemodynamic function and reduce isoflurane gas anesthesia induced depression of cardiovascular output in swine26. Secure a pulse oximeter to the mucosal surface of the tongue with medical tape to monitor heart rate and the saturation of peripheral blood oxygenation (SpO2). Insert a temperature probe approximately 2-4 cm into the nasal cavity to monitor body temperature. Place the pigs on a heated table to maintain normal body temperature (38-40 °C) during the surgical procedure. Ensure surgical sterility with proper tissue preparation. Clean the external surface of the ear to prepare for venous catheterization with 10% povidone-iodine surgical scrub solution and allow the solution to air dry. With a 20 G, 1 inch intravenous catheter, catheterize a marginal ear vein to deliver either intravenous fluids (LRS; 10-50 mL/kg/h) or the addition of other anesthetic agents. Enhance pig anesthesia and analgesia if needed for invasive procedures with continuous intravenous remifentanil hydrochloride infusion (0.05-0.14 µg/kg/min). Place the pig in a lateral recumbent position and gently extend the front leg approximately 10-12 cm away from the shoulder. Clip the hair on the skin surface of the medial aspect of the brachium (upper forelimb). Landmark the distal brachial artery pulse by palpation. NOTE: The landmarked location of the artery lies along an oblique plane with the brachium approximately 9 cm from the olecranon, and 5 cm from the flexor aspect of the elbow joint. The brachial artery travels proximally towards the caudal third of the scapula traversing the humerus. Similarly to step 1.6, ensure surgical sterility with proper tissue preparation. Clean the skin surface with 10% povidone-iodine surgical scrub solution and allow the solution to air dry. Drape the brachial artery catheterization site with four small disposable surgical drapes. Make a 6 cm skin incision with a scalpel blade to expose the underlying tissue. Bluntly dissect with Metzenbaum scissors along the medial surfaces of the biceps brachii, deepening the dissection, until the pulsating artery is identified. Use cotton swabs to gently tease away the adventitia from the brachial artery, median nerve and brachial vein; structures that are in close proximity and within the same fascial plane. Gentle dissection is required, importantly ensuring minimal injury to the median nerve during the procedure. The brachial artery lies approximately 2.0-2.5 cm underneath the skin and is medial to coracobrachialis and lateral to the tensor fasciae antibrachii and overlies a small segment of the medial head of the triceps muscle27,28. NOTE: Place a retractor to keep the skin incision open, allowing easier access to the brachial artery. Place a second retractor (optional) to further assist in vessel exposure. Moisten all tissues with warm saline (37 °C) for the entire dissection to retain better structural integrity and improved tissue handling during the procedure. Create a tunnel under the artery with blunted forceps, then pass three 2-0 polyglactin sutures underneath the artery. Intentionally, leave the ends of this suture relatively long (3-4 cm) to secure the catheter to the artery. Add a "loose suture tie" allowing for quick catheter fastening, to the first two sutures that are separated 1.0 cm from each other and are approximately 1.5-2.0 cm proximal to the third distal suture. Ligate the most distal suture first to occlude the artery. Insert a 22 G, 1 inch peripheral venous catheter into the artery and then advance the catheter (completely to the catheter hub) off the stylet into the vessel. Partially withdraw the stylet from the catheter to visualize arterial blood, ensuring proper vessel placement of the catheter. Then, firmly secure the catheter in the vessel by tying the middle suture. Remove the stylet and quickly cap the catheter to minimize bleeding. Flush the incision and catheter with warm saline (37 °C). Tie the most proximal suture and importantly ensure that the distal suture is tightly secured around the catheter hub as this improves catheter stability and reduces accidental slippage of the catheter from the artery (i.e., during pig repositioning). NOTE: If the initial placement of the catheter into the artery fails, or the vessel is injured, reinsert the catheter into the artery at a position approximately 0.25 cm proximal to the initial catheter insertion site. Quickly attach the LRS filled intravenous extension line with the connected arterial pressure transducer to the catheter, and then lavage the surgical site with warm saline (37 °C), keeping tissues moist, and clean any blood that spilled into the surrounding tissue. Flush the catheter with saline to ensure catheter patency and prevent blood clots from forming along the catheter wall. NOTE: Check for transducer arterial blood pressure line failures (i.e., leaks), establish transducer baseline by zeroing arterial pressure monitor measurements, and ensure proper arterial blood pressure wave formations. Ensure continued catheter patency by maintaining the flush port of the extension line pressurized above 250 mmHg, with a pressure infuser bag delivering 3-5 mL/min LRS. Optional: Place either two 2-0 polypropylene or two 2-0 polyglactin sutures around the catheter hub or intravenous extension line hub to further improve catheter stability within the artery. Close the muscle layers with a simple continuous suture pattern with a 2-0 polyglactin suture on a cutting or tapered needle and close the skin in a simple interrupted suture pattern with a 2-0 polypropylene suture on a cutting needle. NOTE: Interchangeably, 2-0 polyglactin or 2-0 polypropylene sutures can be used to close muscle and skin. Place the pig in ventral recumbency by rotating the abdomen of a lateral recumbent pig toward the surgical table. A left sided lateral recumbent pig is rotated in a clockwise direction, while a right sided lateral recumbent pig is rotated in a counter clockwise direction. Place the catheterized forelimb at a 40° angle to the midline of the vertebral column of the pig. This forelimb positioning generates the best arterial blood flow and the most accurate arterial blood pressure measurements. Measure hemodynamic and respiratory parameters as well as temperature throughout the entire anesthetic and surgical procedure using proper monitoring equipment. Brachial artery catheterization allows for continuous monitoring of arterial blood pressure and intermittent sampling of arterial blood during extended surgical procedures in swine. Measured parameters were collected from seven 50 kg Landrace-Yorkshire commercial pigs as described. The total time required to catheterize the brachial artery was 35.2 ± 4.4 min from the initial artery landmarking to final surgical incision closure (Figure 1). The arterial pressures were measured over 120 min and the systolic, diastolic, and mean arterial pressures were 102.9 ± 1.76, 61.2 ± 0.92 and 74.8 ± 0.89 mmHg, respectively (Figure 2). 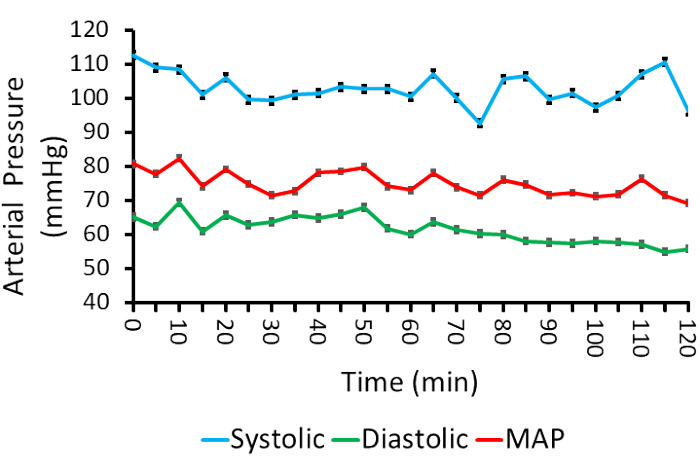 Data from Figure 2 shows a transient drop in systolic blood pressure at 75 min and 120 min during the procedure with subsequent recovery. This is a difficult observation to explain as the event had a short duration and did not appear to have any deleterious effects to the pigs. It is possible the culmination of prolonged surgery, combination of anesthesia (isoflurane gas) and analgesics (remifentanil hydrochloride) affected the systolic blood pressure, but further investigations are needed to determine the mechanism(s) resulting in this observation. Importantly, these measured pressures were similar to arterial pressures observed in pigs anesthetized with either a combination of injectable synthetic narcotic and isoflurane gas or isoflurane gas alone29,30,31. The measured arterial blood gas components over 120 min are shown in Table 1 and include chemical parameters to evaluate acid base balance, hemoglobin content, and electrolyte concentrations. The values presented were within documented arterial blood pressure and clinical chemistry reference ranges for swine18,32,33,34; however a notable finding was the increased anion gap and reduced total hemoglobin at 120 min. These changes in values were likely associated with physiological changes that can occur during a substantive surgical procedure. Importantly, and in the context of arterial catheterization, the information provided underscores that accurate measures of arterial pressures and arterial blood chemistry are easily obtained from brachial artery catheterization. Figure 1: Time requirement: Catheterization of the brachial artery in pigs. Results are expressed as mean ± SEM (n = 7). Solid bar = mean and shaded area = SEM. Figure 2: Brachial arterial pressures in pigs. Systolic = systolic arterial pressure; Diastolic = diastolic arterial pressure; MAP = mean arterial pressure. Results are expressed as mean ± SEM (n = 7). Table 1: Brachial arterial blood measurements in pigs. Results are expressed as mean ± SEM (n = 7). Arterial catheterization to measure arterial blood pressures and collect blood samples for arterial blood gas measurements has been established in a wide range of animal species5,6,7,8,9,10,11,12,13,14,15,16,17,18,19,20,21. The determination of which artery to choose for catheterization is often directed by either the diagnostic application, experimental protocol, or ease of artery access. Indeed, these factors alter the choice for artery catheterization and are not uniformly utilized across animal species. As an example, median caudal (coccygeal) and pedal arteries have been catheterized in dogs during common surgical procedures in a clinical setting6,8. Similarly, the facial and pedal arteries are used in horses to measure arterial pressure due to the relative ease of access in large animal species, such as equids4,7. In contrast to dogs, however, median caudal artery catheterization is not a common site used in horses. Considerations for the application of arterial catheterization are also employed to determine the artery of choice to catheterize in swine, although more esoteric arteries have been catheterized for highly specialized procedures16,17. In general, four common approaches have been used to measure arterial pressures and collect arterial blood gases in swine. The femoral, carotid and medial saphenous arteries are the most commonly used in large pig techniques, while the auricular artery has been used in piglets and miniature pigs22,23. This video describes another method to measure arterial blood pressures and collect arterial blood gas samples in pigs via catheterizing the distal aspect of the brachial artery. Although catheterization of femoral, carotid, medial saphenous, and auricular arteries enables accurate measurement of arterial pressures and arterial blood gases in swine, there are some potential disadvantages to each technique. Carotid artery catheterization requires deep tissue dissection, with often limited visibility of deep structures and the artery, risking injury to the internal jugular vein, the vagosympathetic nerve trunk, and recurrent nerve25,35. The femoral artery is the largest artery of the four common arteries catheterized and should allow for easy catheterization36. Moreover, due to its relative superficial position, less tissue dissection is required to access the femoral artery compared to the carotid artery. Nonetheless, accessing the artery at the cranial aspect of the inner hind limb or near of the inguinal region for arterial catheterization could limit its use. Indeed, femoral artery catheterization would be an impractical procedure in experiments or surgeries that involve the caudoventral, caudodorsal back, or hind limbs. The medial saphenous is a moderate sized artery and could allow for relatively easy catheterization. Similar to the femoral artery, the anatomic location of the medial saphenous artery, as it traverses the medial distal aspect of the hind limb, would limit its application for procedures that involve the lower body of pigs13. Auricular catheterization is a fast method to measure arterial pressures due to the superficial position in the ear11. A potential limitation with this technique is the difficulty of securing the catheter within the vessel, as there is a limited amount of thick skin within the pig ear to place stay sutures. Another limitation is that the auricular artery is also a small artery, and this could potentially cause more technical difficulties for the catheterization procedure12 and viability during long research procedures. More importantly, the greatest disadvantage of catheterizing the auricular artery is the presence of marginal ear veins11,12 that are often the primary vessels used to provide intravenous fluids and administer drugs for anesthesia during surgical procedures. The close proximity of the auricular artery and marginal ear veins, makes the simultaneous catheterization of the vein and artery technically challenging and could interfere with both arterial blood measurements and the administration of drugs and fluids. Catheterization of the distal brachial artery overcomes some of these disadvantages. Firstly, isolation of the brachial artery requires less tissue dissection than isolation of the carotid artery. The brachial artery is also anatomically located closer to the surface, allowing for an easier catheterization, compared to the deeper carotid artery. Secondly, catheterization of brachial artery is a relatively quick procedure and although not as fast as the auricular artery, placement within this vessel permits unrestricted access to marginal ear veins; an important requirement for rehydration therapy and the administration of intravenous drugs and anesthetics during surgery. Finally, a significant benefit of distal brachial arterial catheterization, compared to femoral and medial saphenous artery catheterization, is that the procedure does not interfere with surgical or experimental procedures involving caudoventral, and caudodorsal back, or the hind limbs. As with all experimental methods there are critical steps needed for the successful outcome of procedure. There are three important processes that require particular attention during brachial arterial catheterization. First, accurate topographical landmarking by palpation of the faint pulse of the distal brachial artery is needed. Deviation of the proper location of the vessel within the forelimb will alter the direction of tissue dissection to isolate the vessel and cause unnecessary tissue dissection and injury. Second, careful tissue dissection and catheter insertion is required. This includes gentle separation of the artery from the surrounding fascia, the juxtaposed brachial vein, and the median nerve (minimizing injury to the median nerve), as well as the insertion of the catheter into the vessel with the addition of stay ligatures to secure the catheter into the vessel. Notably, although the brachial artery is a medium sized robust vessel17, rough handling of the artery can lead to the development of microhemorrhages within the vessel intima and potentially induce clot formation along the damaged vessel, thus, increasing the chance of catheterization failure37. Finally, proper positional alignment of the catheterized forelimb is essential for accurate and consistent arterial pressure measurements. Specifically, extending the forelimb at a 40° angle from the midline of the vertebral column provided the best results. Placing the catheterized limb mid thorax and alongside the body, or extending the forelimb directly forward and parallel to the midline of the back may cause a modest reduction in arterial pressures and can be more prone to intermittent loss of arterial pressure measurements. All surgical procedures have innate limitations and the catheterization of the distal brachial artery is no exception. Identifying, localizing, isolating, and catheterizing the artery is a procedure that requires individuals to have a good understanding of not only topographical and vascular anatomy, but also excellent technical and surgical skills. People with this knowledge base and skill set will likely be more successful with catheterizing the brachial artery than people with limited previous experience. The most substantive limitation of this procedure is that brachial artery catheterization may be restricted to non-recovery experimental procedures. Applying this technique to a recovery procedure would require either the removal of the distal suture securing the catheter to the vessel or omitting placing the distal suture during the procedure with a potential subsequent loss of stability. Additionally, in order to secure the catheter hub on the outside of the sutured muscle and skin, a longer catheter would be required. Finally, a recovery procedure would require the removal of the catheter from the vessel. This activity could lead to marked hemorrhaging if adequate hemostasis was not obtained; a process that could be particularly difficult for relatively deep vessels of the limbs of large animal species. Furthermore, if adequate hemostasis was achieved, it is possible the newly formed clot could dislodge during movement or from minor impact (i.e. against pen wall), leading to profound and life-threating arterial hemorrhaging. In conclusion, brachial arterial catheterization is an excellent method to measure arterial blood pressures and collect arterial blood for blood measurements. 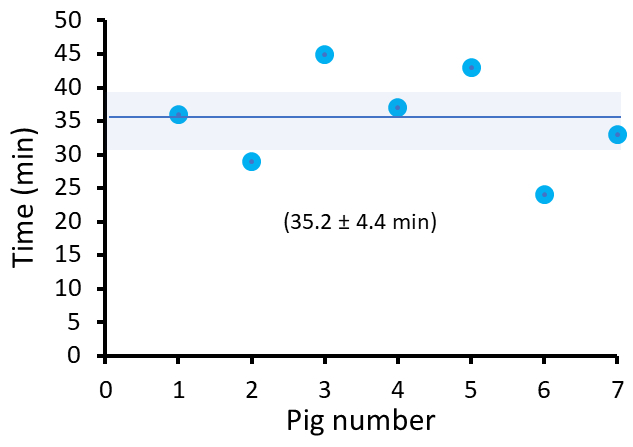 This method produced results in line with observations of arterial blood parameter measurements from the catheterization of different arteries in the pig. In swine this procedure is particularly useful in non-recovery experimental procedures that involve the caudoventral, caudodorsal back, and hind limbs of the pig. This work was supported by the Canadian Institutes of Health Research and Canada Foundation for Innovation grant to V. K. Mushahwar. A. Toossi was supported by a Vanier Canada Graduate Scholarship, Alberta Innovates - Health Solutions Graduate Studentship and a Queen Elizabeth II Graduate Scholarship. V.K. Mushahwar is a Canada Research Chair in Functional Restoration. We would like to acknowledge Mr. J. Stack of Moss Street Productions for his help with the audio production and staff of the Surgical Medical Research Institute for their assistance with the procedures. Uwiera, R. R., et al. Plasmid DNA induces increased lymphocyte trafficking: a specific role for CpG motifs. Cellular Immunology. 214, (2), 155-164 (2001). Uwiera, R. R., Kastelic, J. P., Inglis, G. D. Catheterization of intestinal loops in ruminants. Journal of Visualized Experiments. (28), (2009). Uwiera, R. R., Mangat, R., Kelly, S., Uwiera, T. C., Proctor, S. D. Long-Term Catheterization of the Intestinal Lymph Trunk and Collection of Lymph in Neonatal Pigs. Journal of Visualized Experiments. (109), (2016). Wohlfender, D. H., et al. International online survey to assess current practice in equine anaesthesia. Equine Veterinary Journal. 47, 65-71 (2015). Dugdale, A. H., Taylor, P. M. Equine anaesthesia-associated mortality: where are we now? Veterinay Anaesthesia Analgesia. 43, (3), 242-255 (2016). McGrotty, Y., Brown, A. Blood gases, electrolytes and interpretation 1. Blood gases. In Practice. 35, (2), 59-65 (2013). Taylor, P. M. Techniques and clinical application of arterial blood pressure measurement in the horse. Equine Veterinary Journal. 13, 271-275 (1981). Trim, C. M., Hofmeister, E. H., Quandt, J. E., Shepard, M. K. A survey of the use of arterial catheters in anesthetized dogs and cats: 267 cases. Journal of Veterinary Emergency and Critical. 27, 89-95 (2017). Komine, H., Matsukawa, K., Tsuchimochi, H., Nakamoto, T., Murata, J. Sympathetic cholinergic nerve contributes to increased muscle blood flow at the onset of voluntary static exercise in conscious cats. American Journal of Physiology - Regulatory, Integrative and Comparative Physiology. 295, (4), R1251-R1262 (2008). Krista, L. M., Beckett, S. D., Branch, C. E., McDaniel, G. R., Patterson, R. M. Cardiovascular Responses in Turkeys as Affected by Diurnal Variation and Stressor. Poultry Science. (60), 462-468 (1981). Bass, L. M., Yu, D. Y., Cullen, L. K. Comparison of femoral and auricular arterial blood pressure monitoring in pigs. Veterinay Anaesthesia Analgesia. 36, (5), 457-463 (2009). Karnabatidis, D., Katsanos, K., Diamantopoulous, A., Kagadis, G. C., Siablis, D. Transauricular arterial or venous access for cardiovascular experimental protocols in animals. Journal of Vascular and Interventional Radiology. 17, (11 Pt 1), 1803-1811 (2006). Namba, K., Kawamura, Y., Higaki, A., Nemoto, S. Percutaneous medial saphenous artery approach for Swine central artery access. Journal of Investigative Surgery. 26, (6), 360-363 (2013). Hong, Y., et al. Feasibility of Selective Catheter-Directed Coronary Computed Tomography Angiography Using Ultralow-Dose Intracoronary Contrast Injection in a Swine Model. Investigative Radiology. (50), 449-455 (2015). Kumar, A., et al. Aortic root catheter-directed coronary CT angiography in swine: coronary enhancement with minimum volume of iodinated contrast material. American Journal of Roentgenology. (188), W415-W422 (2007). Park, J. H., et al. Safety and Efficacy of an Aortic Arch Stent Graft with Window-Shaped Fenestration for Supra-Aortic Arch Vessels: an Experimental Study in Swine. Korean Circulation Journal. 47, (2), 215-221 (2017). Carniato, S., Mehra, M., King, R. M., Wakhloo, A. K., Gounis, M. J. Porcine brachial artery tortuosity for in vivo evaluation of neuroendovascular devices. American Journal of Neuroradiology. 34, (4), E36-E38 (2013). Hannon, J. P., Bossone, C. A., Wade, C. E. Normal Physiological Values for Consious pigs used in Biomedical Research. Laboratory Animal Science. 40, 293-298 (1990). Nijland, M. J., Shankar, U., Iyer, V., Ross, M. G. Assessment of fetal scalp oxygen saturation determination in the sheep by transmission pulse oximetry. American Journal of Obstetrics and Gynecology. 183, (6), 1549-1553 (2000). Yawno, T., et al. Human Amnion Epithelial Cells Protect Against White Matter Brain Injury After Repeated Endotoxin Exposure in the Preterm Ovine Fetus. Cell Transplantation. 26, (4), 541-553 (2017). Amaya, K. E., et al. Accelerated acidosis in response to variable fetal heart rate decelerations in chronically hypoxic ovine fetuses. American Journal of Obstetrics and Gynecology. 214, (2), e270-e271 (2016). Malavasi, L. M. Swine. Anesthesia and Analgesia for Domestic Species. 5, John Wiley & Sons Inc. New Jersey. (2015). Moon, P. F., Smith, L. J. General Anesthetic Techniques in Swine. Veterinary Clinics of North America: Food Animal Practice. 12, (3), 663-691 (1996). Caramoni, P. R. A., et al. Postangioplasty restenosis: a practical model in the porcine carotid artery. Brazilian Journal of Medical and Biological Research. (30), 1087-1091 (1997). Sisson, S. The Anatomy of the Domestic Animals. 2, W. B. Saunders Company. Philadelphia. 636-638 (1930). Lundeed, A. B., Manohar, M., Parks, C. Systemic distribution of blood flow in swine while awake and during 1.0 and 1.5 MAC isoflurane anesthesia with or without 50% nitrous oxide. Anesthesia and Analgesia. 31, 499-512 (1983). Sisson, S. The Anatomy of the Domestic Animals. 2, W. B. Saunders Company. Philadelphia. 302-304 (1930). Adin, C. A., Gregory, C. R., Adin, D. B., Cowgill, L. D., Kyles, A. E. Evaluation of three peripheral arteriovenous fistulas for hemodialysis access in dogs. Veterinary Surgery. 31, (5), 405-411 (2002). Gladczak, A. K., Shires, P. K., Stevens, K. A., Clymer, J. W. Comparison of indirect and direct blood pressure monitoring in normotensive swine. Research in Veterinary Science. 95, (2), 699-702 (2013). Wenzel, K., et al. Survey of Effects of Anesthesia Protocols on Hemodynamic Variables in Porcine Cardiopulmonary Resuscitation Laboratory Models Before Induction of Cardiac Arrest. Comparative Medicine. 50, (6), 644-648 (2000). Duval, J. D., Pang, J. M., Boysen, S. R., Caulkett, N. A. Cardiopulmonary Effects of a Partial Intravenous Anesthesia Technique for Laboratory Swine. Journal of the American Association for Laboratory Animal Science. 57, (4), 376-381 (2018). Friendship, R. M., Lumsden, J. H., McMillan, I., Wilson, M. R. Hematology and Biochemistry Reference Values for Ontario Swine. Canadian Journal of Comparative Medicine. (48), 390-393 (1984). Kiorpes, A. L., MacWilliams, P. S., Schenkman, D. I., Bickstrom, L. R. Blood Gas and Hematological Changes in Experimental Peracute Porcine Pleuropneumonia. Canadian Journal of Veterinary Research. (54), 164-169 (1990). Klem, T. B., Bleken, E., Morberg, H., Thoresen, S. I., Framstad, T. Hematologic and biochemical reference intervals for Norwegian crossbreed grower pigs. Veterinary Clinical Pathology. 39, (2), 221-226 (2010). Sisson, S. The Anatomy of the Domestic Animals. 2, W. B. Saunders Company. Philadelphia. 804-810 (1930). Lopes-Berkas, V. C., Jorgenso, M. A. Measurement of Peripheral Arterial Vasculature in Domestic Yorkshire Swine by Using Quantitative Vascular Angiograph. Journal of the American Association for Laboratory Animal Science. 50, (5), 628-634 (2011). Geary, R. L., et al. Wound healing: A paradigm for lumen narrowing after arterial reconstruction. Journal of Vascular Surgery. (27), 96-108 (1998).